I have to say that the last week’s preparations for International Day still had an impact on your child this week. K1 continued saying a poem about a mouse that lived in a windmill, and K2 happily reflected on their outfits and all the food they could try last Friday. This week hasn’t required any rehearsing or making props for a school event nevertheless was rich in many learning experiences. Each class was learning about environments related to water. Nursery 2 was investigating pond life, K1 was learning about islands and K2 was expanding their knowledge about rivers and bridges. All the students used their personal experiences to share with others. Living in Thailand definitely helps young learners to study about all of the above subjects. We are looking forward to the next week and more fun and creative activities. ‘Pond’ was our topic for this week in Nursery 2. We looked at pictures of different kinds of ponds such as fish ponds, flower ponds and swimming ponds. We learnt about different species that live in ponds and ones that live by ponds. We also learnt about the kind of plants that grows in ponds and how they provide shelter, food and oxygen to the fish and other species that lives in ponds. In Math, we practiced counting 1-10 by feeding insects to a frog. We also practiced recognising numbers by catching numbered fish from the fish pond small world tray. In phonics, we practiced using our listening ears to listen to different rhythms and move in time to the beat such as very slow, normal pace, fast and so on. In movement class, we pretended to be pond creatures and moved around the classroom pretending to swim like a fish and hopping like a frog. We also worked on our balance using bean bags and walking on a line drawn on the floor. Nursery responded very well to this activity and they were all very excited! In art, the children made tissue roll goldfishes and paper plate frogs. 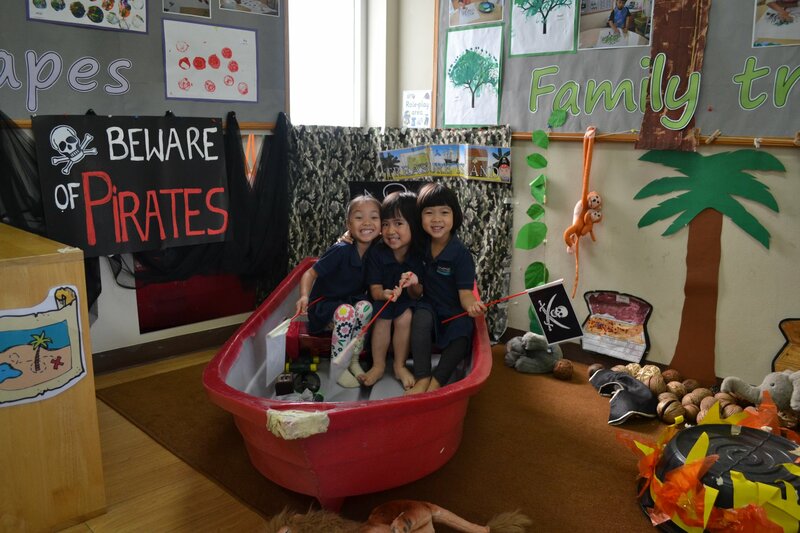 This week K1 went on geographical learning adventure to learn more about islands. We started by looking at the globe so K1 could work out themselves what ‘island’ means. K1 came up with some ideas such as “It’s a land”, “It’s close to the water”, “You can get there by boat” and many more. K1 shared their experiences about islands they visited/would like to visit during ‘show and tell’ time. We learned that Thailand is a holiday destination for many people from around the world because of the number of beautiful islands. We also learned what maps are used for and how to read them. One of the students said “Map is a GPS”. We even made our own, large scale treasure map. It was interesting to look at not only tropical islands, but also cold islands like Svalbard, Iceland and Greenland. In the writing area we practiced a lot to form letter ‘u’ which was also our sound of the week. In Maths we were learning about weight. We compared a weight of a variety of objects using vocabulary such as ‘heavy’, ‘heaviest’, ‘lighter’ and ‘same’. We also continued completing our “Number Books”. This week we focused on number 2. On Thursday we sang Happy Birthday to Pearl. Thank you for a yummy cake! This was an interesting week in K2, as we studied ‘Rivers & Bridges’! The children brought in lots of pictures from home that prompted discussion about different types of bridges. On our Discovery Table K2 had fun investigating a variety of methods and materials for building a ‘bridge’ across a ‘river’, then tested their designs for strength using some play people. In Art, we enjoyed using a glue gun for the first time, carefully joining lollipop sticks to make a wooden raft with a sail. We had races along the ‘river’, blowing through a straw to make the ‘wind’ move our rafts. We had a busy week in Literacy studying our /oo/ words – look good took school – the words were hiding inside a balloon that Mr.Phil had to pop! In Maths we continued to become more familiar with numbers to 100. We found missing numbers on our 100-square, counted to 100 in hops of 10, and played a game to practice adding and subtracting 1 with numbers to 100. Hampton International Pre-School is an independent and privately owned early childhood school situated at Chaengwattana and Sathorn (City Campus) in Bangkok, Thailand. Mon - Sat 8am - 6pm.